Darkness was slithering in across the quiet green hills. My frogman warrior was utterly unprepared for the terrors of the night. Armed only with a lantern that may as well have been an elderly firefly and my handcrafted saber that looked like it was forged by a lazy toddler I ventured on towards a massive pyramid. Unable to reach the nearest town at night my best hope lay in plundering the riches of the pharaohs. Before I could reach the tomb though I was confronted by terror incarnate. I had stumbled into a pack of murderous cartoon bees. They paused for the only the briefest of moments before reducing me to a pile of quivering cubes. I respawned even more lost than ever. At least this spot was mercifully free of bees. A setback to be sure but it only took a short scan of the skyline before my spirits were lifted by the sight of a gigantic glowing tree in the distance. This is Cube World and getting lost, especially when you bring a few friends along for the ride, is more or less the whole point. Exploration is the heart and soul of Cube World. Boiled down to its core it is the love child of Skyrim and Minecraft. It’s the digital cure to wanderlust and rambling across the cube based landscapes can evoke moments of pure gaming bliss. You’ll float across snowy peaks on a stout little hang glider, venture into forests so dense you’ll need a lantern, even in broad daylight, and storm ancient castles brimming with legions of orcs. Like Minecraft every world is unique and endless. It’s been a long time since a game so thoroughly captivated me with the thought of what might lie beyond the horizon. Bundled in with the superb exploration are all the trappings of a traditional RPG. You can choose from the standard mage, warrior, rogue or ranger archetypes and combat is simple but surprisingly satisfying. You’ll return to town loaded with mountains of loot pried from the hands of evil doers and sell it to the friendly neighborhood armor vendor. You can even tame a huge variety of wildlife and can actually ride most of them. All the features you’d expect from a modern RPG are present, although a little bare bones at the moment. There is one spin on the usual RPG mechanics that took me by surprise though. Throughout your journeys you’ll uncover nodes of various resources like wood, iron and silk. These can then be used to make everything from potions to armor and new recipes drop frequently. That certainly sounds like the basis of every crafting system that has ever existed and you’re not wrong. What makes this particular system interesting is the ability to change your weapons block by block by adding metal or gems. This not only gives every weapon you use a personal touch but also adds damage or special properties to your armaments. My massive sword may have looked like the terrible spawn of a coat rack and a machete but it was my coatchete and I grew to love every swing of it. Cube World does start to remind you that it’s a work in progress when you begin to level up though. The skill trees are currently about as basic as you could imagine. The developers are planning on expanding them but at the moment prepare to be disappointed after your first few trips to the skills menu. More troubling than the simple skill tree is the fact that there is no level cap. On paper it seems like the perfect pairing to endless procedurally generated worlds. The reality though is that every level nets you a smaller increase of power. The game has only just been released as an alpha build so in time hopefully a more satisfying skill tree will give leveling more meaning. At the moment though after you’ve unlocked the few skills that exist and put a smattering of points into each of your abilities level ups become largely meaningless. What Cube World does achieve though is a simple but powerful distillation of what has made so many open world RPGs special. The game world may be made entirely of cubes but it is vibrant and alive. At times even breathtaking. 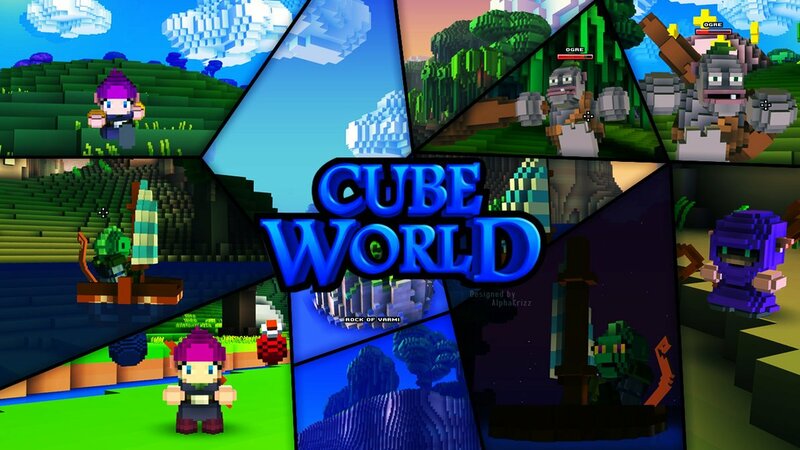 If the final product can manage to fill in some of the gaps in content, and the developers seem keen address just that, then Cube World may very well end up one of the most bewitching games in recent memory. Charlie is ski instructor and writer living in Steamboat Springs, Colorado. When he's not out on the slopes he's struggling to stay out of bronze division in League of Legends.